I went to San Antonio last weekend to give a lecture, visit Mom, and see old friends from my 18 years working at the University of Texas Health Science Center and participating in the Greater San Antonio Quilt Guild. The first page includes sketches from the Hilton Palacio Del Rio Hotel. I loved the perspective on the torchere and the color variation in the large marble wall hanging which is an outline of the Alamo. On the top right is a small sketch done with a 1:4 ratio viewfinder (Wet Canvas Drawing Basic Class 102 - Class 2 - Assignment 1 on Creativity). 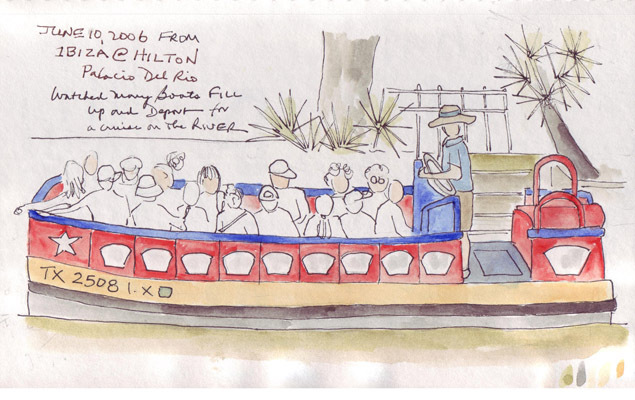 The second page was done from the Hilton outdoor cafe on the Riverwalk to commemorate the famous San Antonio Riverboats which fill up and empty at the landing directly across the river (really a small canal) from where I was sitting enjoying my annual margarita and cheese/fajita beef nachos. 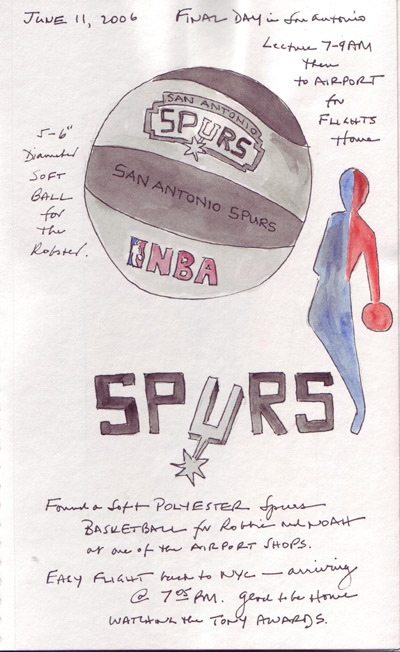 The 3rd page is a sketch of the small, soft Spurs basketball that I purchased in the airport to bring back for my oldest son (the big San Antonio Spur's fan) and his 10 month old son. It is perfect for the weekly EDM challenge which was announced <24 hours later. My favorite beverage is coffee, especially when I wake up at 5:30 AM on work days. 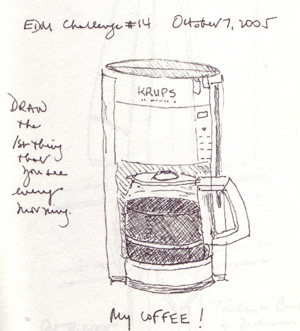 I sketched our Krups automatic drip coffee pot for EDM Challenge #14 - "The First Thing That I See in the AM" shortly after I joined the EDM group last fall. 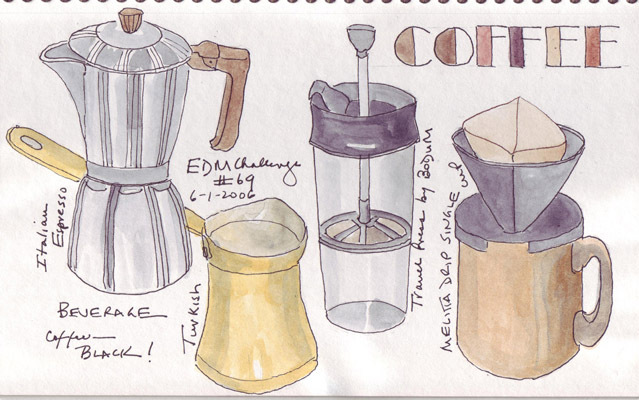 This time I decided to draw other ways that I have to make good, black coffee: an Italian espresso pot, a brass Turkish coffee pot, a Bodum travel press that allows me to make pressed coffee and then drink it from the same cup, and a Melitta filter for an individual mug to make a single cup of drip coffee. It is very apparent that my style has changed significantly in the last 8 months. I didn't start adding watercolor washes to my pen sketches regularly until December and now prefer COLOR! 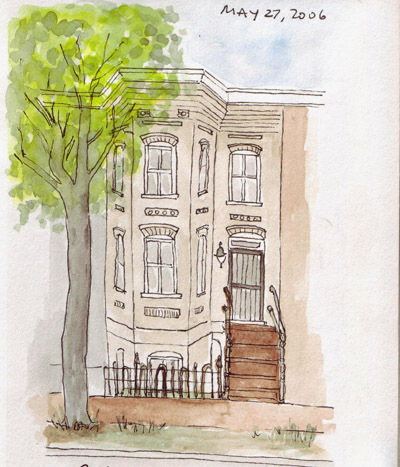 One of my sons and his wife just bought an East Capitol Hill row house and this weekend all 4 parents joined them for a marathon painting session. Although I travel to Washington DC on business at least yearly, I wasn't familiar with these charming rowhouses and immediately wanted to do a quick sketch. 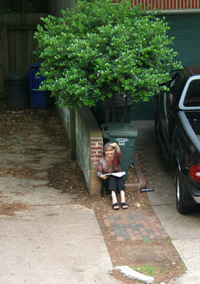 I did take a break from taping walls Saturday afternoon and here is both my sketch and a photo of me sketching while sitting on a brick ledge (ouch!) which my son took from an upstairs window. 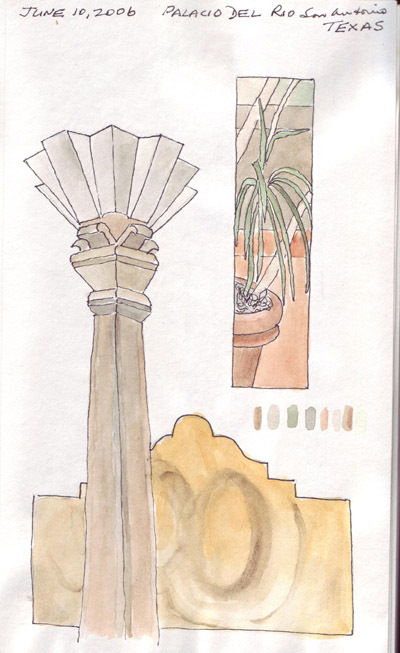 This sketch was done in my 5 1/2 by 8 1/2" sketchbook so I don't have many architectural details. However, I did more sketches of individual details over the rest of the weekend - and hope to do many more sketches when they finally move in. I have sketched several computers in the last few months, so I added two of the old images to the new sketch that I did for the EDM challenge. All of the images can be enlarged further by clicking on them. Computer 1: I use this old laptop on the desk because my husband and I spend alot of time in the library and I have the most extensive collection of bookmarks on this list of favorites. It has never been used on battery and rarely removed from the library. Computer 2: I spent many hours preparing a course exam, both at home and in my office - carrying the textfiles between sites with my trusty flash drive. 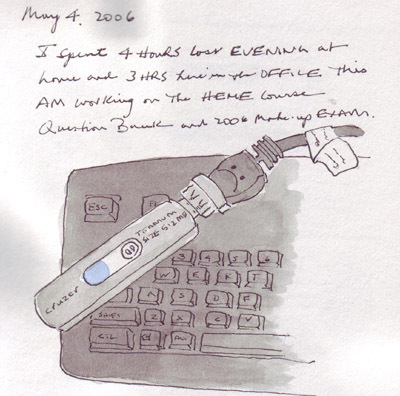 This sketch of the keyboard and flash drive was done during lunch. Computer 3: We just got a new laptop which is much better prepared for travel to London and back. A camera has been added so hopefully we will be able to communicate with our family and actually see the children daily! My husband was unpacking it when I did this sketch. 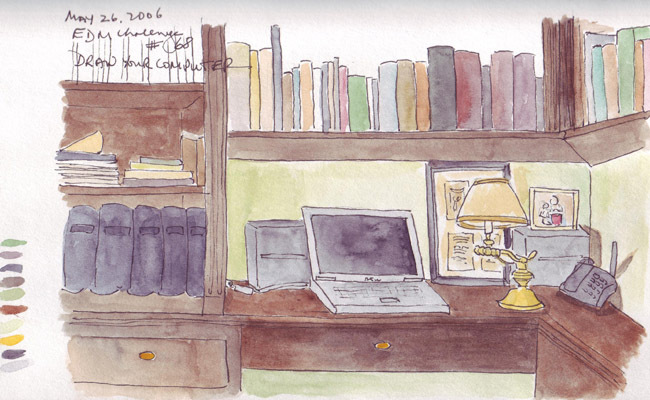 I'm still completing one sketch per day (usually pen with watercolor wash) in 2006. 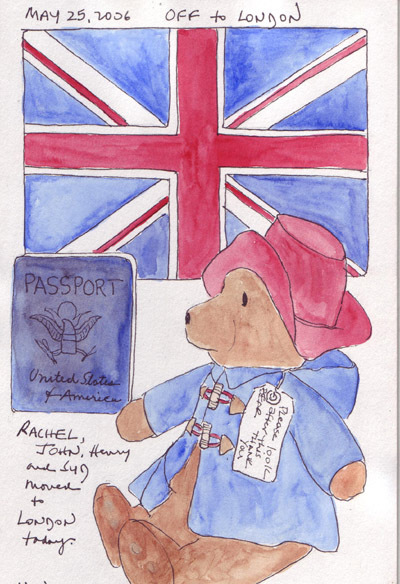 This week the sketches all were inspired by my two oldest grandchildren (ages 2 1/2 and 16 months) as they prepared to move to London for at least one year. 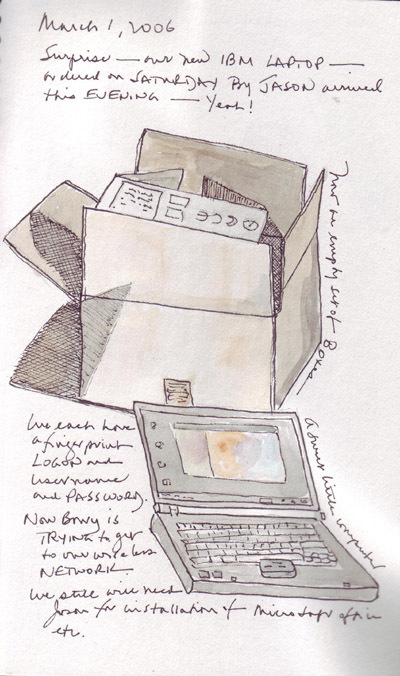 Last night I did this sketch as they were boarding their overnight flight, and at 5AM I got up to check for their email that they "landed and were leaving the airport" to go to their new home. October in London is a month-long celebration of drawing at multiple venues and I will definitely be there to enjoy it!